As we were having a conducted tour round Lynn Rival we made a comment about their nav lights, Paul started singing the praises of the Aquasignal range of LED navigation lights, very low power consumption, with an average lifetime of 20.000 hours or more. For comparison conventional navigation lights have an average lifetime of between 800/1000 hours without variation in temperature or mechanical shock. LED lights are not sensitive to these same conditions. This entry was posted in General Interest and tagged Aqua Signal on December 29, 2012 by Iain Forrest. It was nice to meet up again with Paul and Rachel Chandler who showed us round the restored Lynn Rival, impressed with the paint job on the topsides, apparently it had been brushed on! 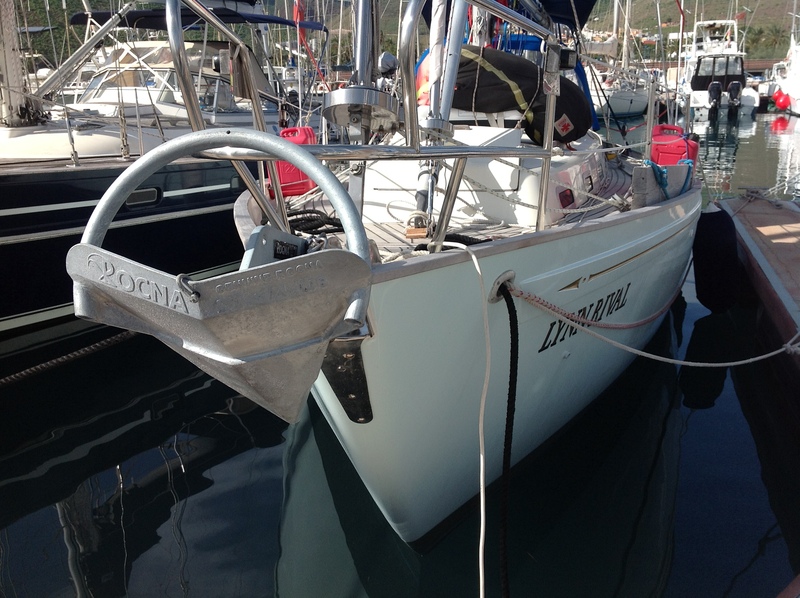 Awlgrip had been used which of course is distributed by Marineware, from whom we purchase our Epifanes paint, varnish and SP epoxy. Couldn't help notice that they had put their faith in a Rocna anchor, which is one of the new generation anchors that we stock, others are the Manson Supreme and Knox anchors. This entry was posted in General Interest and tagged Epifanes, Knox, Manson, Marineware, Rocna, SP gurit on December 27, 2012 by Iain Forrest. Look forward to meeting up with Paul and Rachel Chandler and (hopefully) a conducted tour round Lynn Rival. 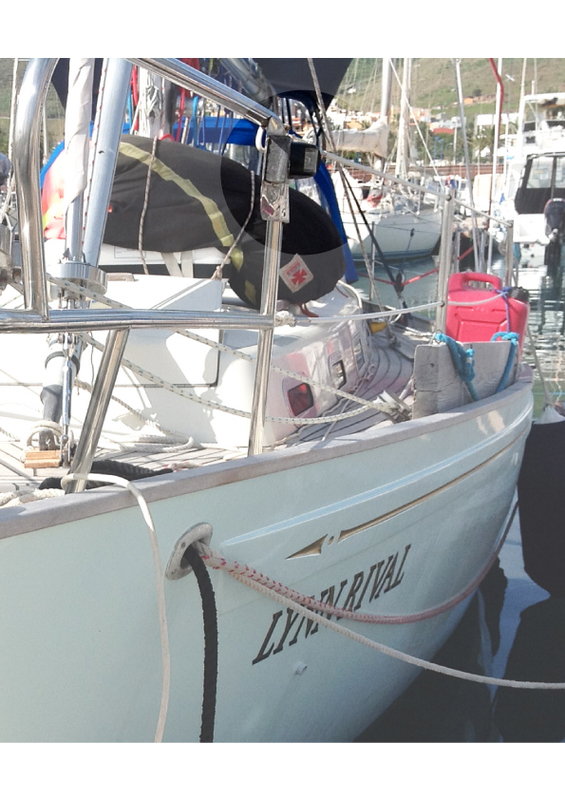 On board our Channel 31 are their urgently needed spares, Baltic Safety Line, Glomex PL259 VHF Connectors and some 10mm solid red braid for their third reef. The couple are currently in La Galleta Tenerife but due to arrive San Sebastian later today. This entry was posted in General Interest and tagged Baltic, Glomex on December 26, 2012 by Iain Forrest. It is but rarely that we bother about 'hot meals' aboard our Channel 31 out in the Canaries, usually loads of salad with cold meat or fish, or a trip to a local restaurant on Christmas Day (that's another story). The image to the left shows Jenny slaving over the Neptune stove on Christmas Day in a very happy mood, was it the champagne reception on the pontoon at San Sebastian or the wine afterwards? What did we eat, roast chicken, fried potatoes and onions, carrots, green beans and a Gomerian vegetable that looked like a big green tomato (the girl in the market who spoke no English and could not understand our poor Spanish had indicated via sign language that it went well with green beans, this feast was followed up by mince pies and then a two hour snooze. As many will know Plastimo has been in 'difficulties' this year but we are pleased to advise that the popular range of cookers that they used to distribute are now being handled by Bainbridge. This entry was posted in General Interest and tagged Bainbridge, Neptune on December 25, 2012 by Iain Forrest. 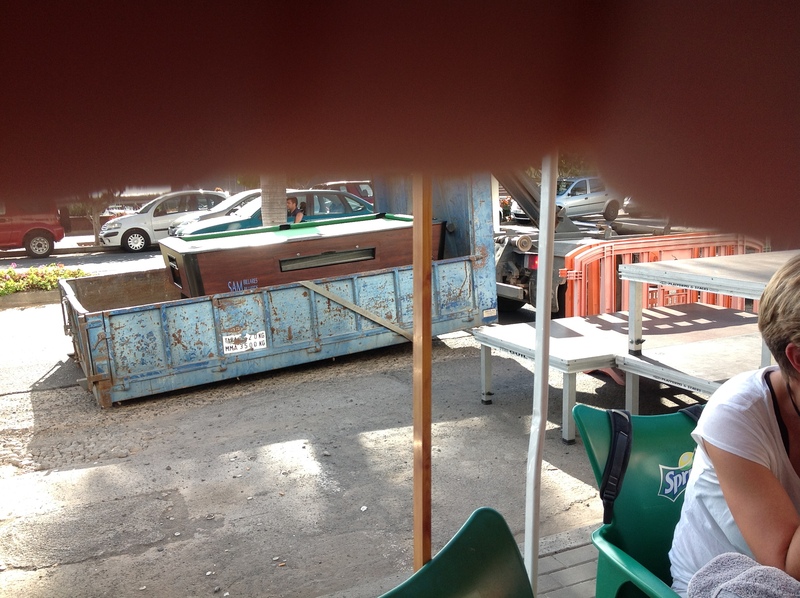 There I was sitting in the bar across the road from the marina, thinking about the February newsletter that I had to start composing, (only reason I was in the bar was that it has Wi-Fi and it's free, not because of the beer), when this truck turns up and dumps a pool table on the main road outside! 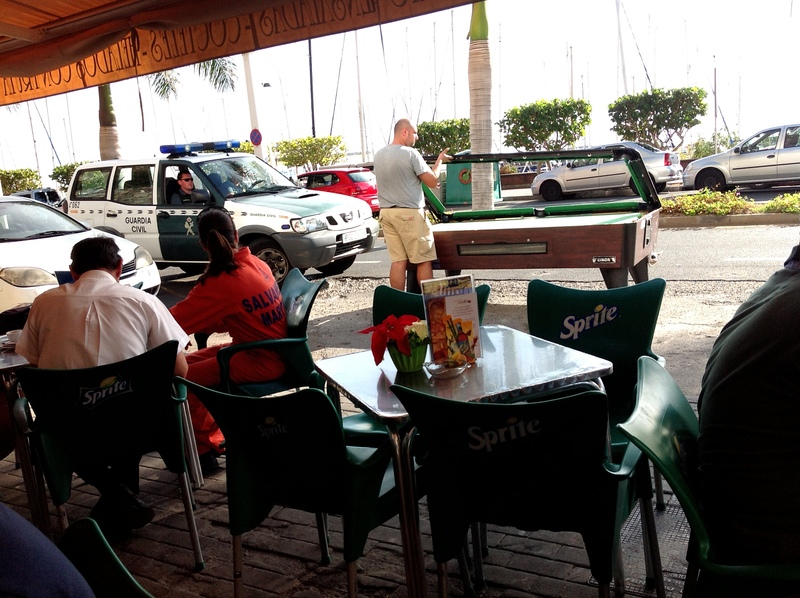 Shortly after the table was 'dumped' the local Guardia Civil turned up and demanded they move it from the middle lane of the Avenue Fred Olsen. Speaking of balls, I wish I had some Harken McLube 'One Drop' ball bearing lubricant on the Channel as despite washing out the self tacking traveller with fresh water it's still not sliding as well as it should! 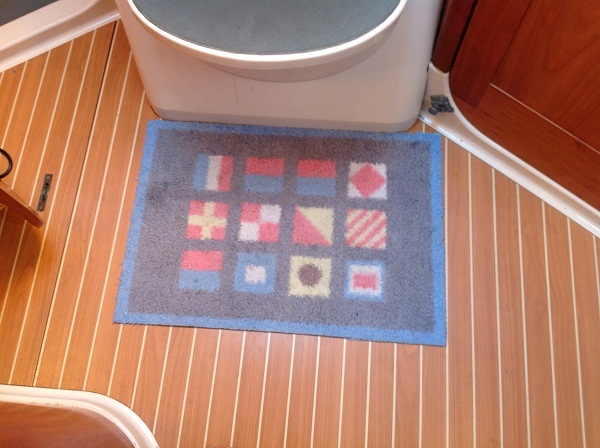 This entry was posted in General Interest, Tips and Advice and tagged Harken, McLube on December 22, 2012 by Iain Forrest. No wind today so back to boat chores, had been meaning to clean out the gas locker for over a year but once I get into holiday mood! Anyway, today its cloudy and not too hot, only 23 degrees, so up came locker lid and out came the gas bottle. First thing I noticed that the Alde gas leak detector needed a top up and of course there were the rust stains on the GRP moulding where the bottle sits. 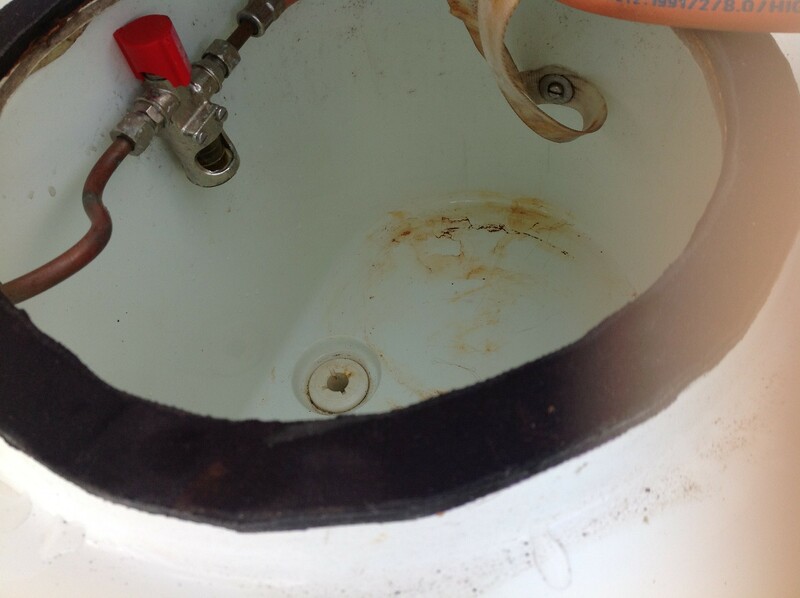 Fortunately we had on board some Starbrite rust stain remover which did the trick (still need to do a little more work on one particularly stubborn stain) As for refilling the gas detector, am sure I have a sachet on the boat, just a matter of finding it! failing that we do have a Omnitron portable gas detector which I can use on Christmas day to check for leaks as Jenny is determined that we have a meal on board, roast chicken, fried potatoes, green beans and a few glasses of wine! This entry was posted in General Interest, Tips and Advice and tagged Alde, Omnitron, Starbrite on December 21, 2012 by Iain Forrest. We've been rarely troubled by insect bites in the years we have sailed in the Canaries, perhaps that's why we have grown complacent, however, the other night we were attacked whilst we slept! We do carry on board the Marinet hatch mosquito nets, they have been dug out and are now in place! Next time we go out though we need to take a Companion Way Mosquito Net (by Waterline design) out as we tend to put the wash boards in place, which does tend to make the interior a little bit hot and sticky! See the You Tube video on our site. Blue Performance also do a range, the choice is yours! This entry was posted in General Interest and tagged Blue Performance, MariNet on December 21, 2012 by Iain Forrest. This entry was posted in Tips and Advice and tagged Turtle mat on December 20, 2012 by Iain Forrest. 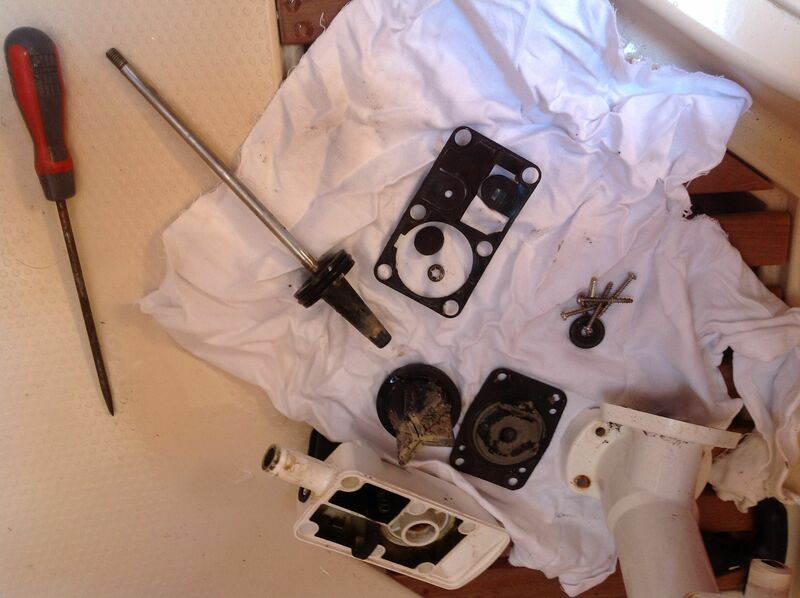 First task had to be servicing the toilet, didn't it! Honoured guests left yesterday and then out came the note pad, toilet to service, stainless to polish (gets tarnished due to the Sahara sand coating the surface) scuff marks to remove from the hull etc etc. 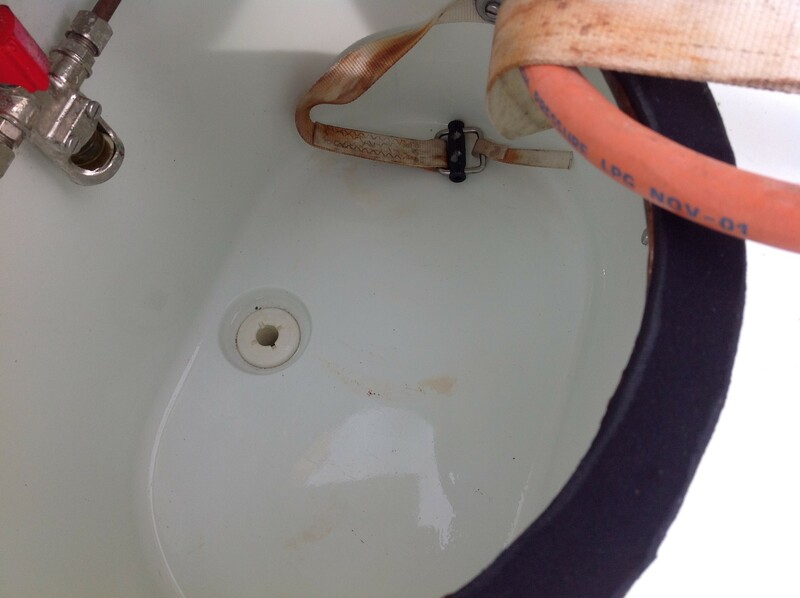 When we leave the boat for a long period of time I always put LeeScale into the system, helps break down the build up of calcium, however last time family were out it was not done, whether that was the cause of a poorly functioning loo or it was the rivet that failed on the top valve gasket. Fortunately we carry a spare Jabsco spares kit on board, incidentally there are three different types depending on the age of the toilet. Took the opportunity to change the Yachticom Purytec cartridge as well then just before retiring exhausted to my bunk later added some Yachticom Head Lube which lubricates all rubber seals. This entry was posted in General Interest, Tips and Advice and tagged Jabsco, Leesan, yachticon on December 19, 2012 by Iain Forrest. Should never have taken the International Paint 'Mystery Shopper' prize which was an I-pad out to the yacht, as after taking an image of the new MG Duff hanging anode and sending it back to base, Andy, who is manning the pumps back in Newcastle, emailed to say the pushpit was looking a bit scruffy! No problem cleaning it as on board we had a container of Spotless Stainless, great product, you paint it on, make sure it stays wet and thirty or so minutes later wash it off with fresh water, the warmer the day the quicker it works,don't wish to crow but today, after ten minutes the metal work was looking like new! Glad the I-pad was in its Aquapac cover as yours truly managed to wash not only the metal work but Jenny and the pad! This entry was posted in General Interest, Tips and Advice and tagged Aquapac, International Paint, MG Duff, Spotless Stainless on December 18, 2012 by Iain Forrest.